Mitt Romney and Paul Ryan stand in stark contrast to the failed policies and divisive values of the Obama Administration. I cannot think of a better choice to help Mitt Romney lead America's Comeback Team than my friend Paul Ryan. 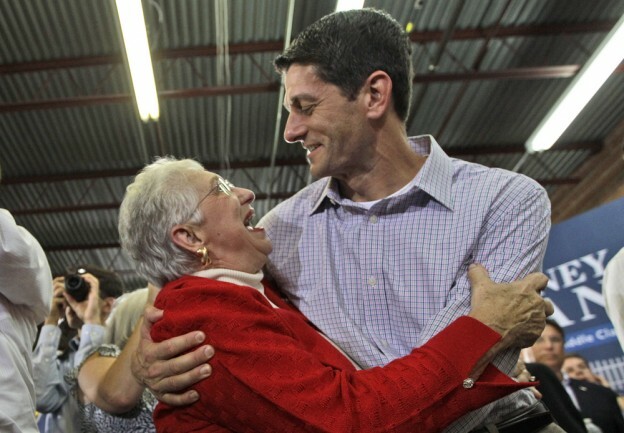 For years, Representative Ryan has been a bold, principled leader in the fiscal reform movement. With honesty, he's communicated the gravity of our government's financial crisis, and he's had unmatched nerve in proposing real solutions, devoid of gimmickry and demagoguery, to lead the country in a better direction. I've stood with Paul Ryan since he authored his first comprehensive budget bill, and I will continue to stand with Mitt Romney and Paul as they make their case for smaller government and restored prosperity to the American people. This is an election of ideas, and Romney's choice of Paul Ryan as his running mate solidifies that. Together they are a testament to American values and the principles of hard work, individual responsibility, and the belief that government should celebrate, not diminish, the success of its citizens. What a tremendous contrast. You wanna get outta here? Go someplace where we can, you know, talk. I mean, without him? He’s kind of a drip, but you’ll go places. Please please please take me with you! I’ve got some food in my purse that I’ll share. Promise! Where can I go throw up? In your tin foil hat? Oh how joyous this day to see she said she meant. You know how I long for these. It is very interesting that you have to put words in Foxx's mouth in order to say anything bad about her. That kills your credibility. Yes, because there is no such thing as political satire. Satire should probably be left to those who have a talent for it.